La Botte Gardiane proposes you its artisan sandals of leather, of high quality entirely manufactured in our workshop located near the Camargue, between Nîmes and Montpellier. Upscale sandals, custom-made on request. Here is one of our favorite sandals. Chic and elegant, with thin straps crossed (that you can customize to envy), this sandal is also very comfortable. The ankle strap is interchangeable. Options : beige slip pads (heel and sole of leather). Other colors on request. Shipping included to mainland France. Comfort, elegance and a little height to refine the silhouette. A must for sunny days at the beach, stroll, or in the evenings, you will not leave your wedge sandals. Other colors: click HERE. Ability to customize the leather coating, please contact us. Shipping included to mainland France. Here is a leather sandal which in addition to being elegant, protects your heel. Attention, with its closed back, this model shoes small (about 1/2 size below). Options : beige slip pads (heel and sole of leather). Other colors on request. Shipping included to mainland France. Here is a model of leather sandal in timeless style, chic, easy to put on, and that holds up well to the foot. Always entirely made in France, with the most beautiful leather and a unique know-how. Options : beige slip pads (heel and sole of leather). Other colors on request. Shipping included to mainland France. Born in 1920 in Saint-Tropez, you find in our range this mythical sandal, as faithful as the original. Entirely made in France by hand in our workshop. You can customize leather straps. Options : beige slip pads (heel and sole of leather). Other colors on request. Shipping included to mainland France. Sandal very trendy, well adjusted. You will appreciate its look, you will also like the quality of the leathers used and the care that we take to its manufacture. Options : beige slip pads (heel and sole of leather). Other colors on request. Shipping included to mainland France. Straps and still straps for this very elegant sandal that dresses the foot and sublime it. Made with the best leathers and handmade in our workshop located between Nimes and Montpellier. Options : beige slip pads (heel and sole of leather). Other colors on request. Shipping included to mainland France. 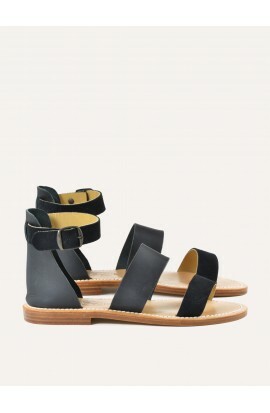 This casual sandal with wide straps leather is easy to put on. Without adjustment, it takes as long to walk very well. It's the perfect shoe to enjoy your summer days. Options: beige slip pads (heel and sole of leather). Other colors on request. Shipping included to mainland France. Leather sandal with wide flanges, well balanced, which covers and holds the foot well. Crafted in France, in our workshop, you will appreciate the quality of the leathers and the finesse of the work. Options : Half sizes, beige slip pads (heel and sole of leather). Other colors on request. Shipping included to mainland France. With the Spartan, we go back to the origins of the sandal.Here is a simple and pure leather model, with its lace which surrounds and subtly dresses the ankle. Options : beige slip pads (heel and sole of leather). Other colors on request. Shipping included to mainland France. 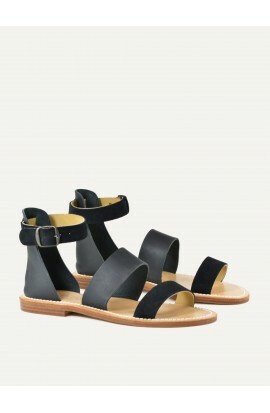 Leather sandal with wide straps, easy to slip on. Made in Camargue (south of France, near Montpellier and Nîmes), with high quality leather. Options: beige slip pads (heel and sole of leather). Other colors on request. Shipping included to mainland France. 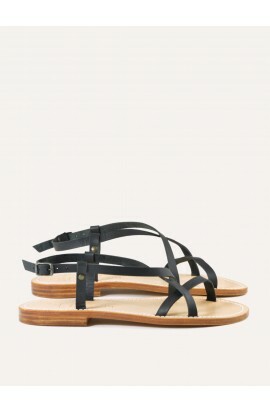 This casual sandal with wide straps leather is easy to put on and comfortable with crossed straps. It's the perfect shoe to enjoy your summer days and evenings. Options: beige slip pads (heel and sole of leather). Other colors on request. Shipping included to mainland France. Nuxr : timeless design shoes. You will like its comfortable ankle strap. A contemporary touch in black monochrome. Option : non-slip pads (heel and leather sole). Other colors here. Shipping included to mainland France. This is a quality sandal! Exceptional leathers, unique French savoir-faire, style and comfort. You can customize the straps according to your wishes: more than 60 colors available. Options : beige slip pads (heel and sole of leather). Other colors on request. Shipping included to mainland France. Several thin crossed straps & between fingers for this very elegant sandal that dresses the foot and sublime it. Made with the best leathers and handmade in our workshop located between Nimes and Montpellier. Options : beige slip pads (heel and sole of leather). Other colors on request. Shipping included to mainland France. Chic and refined this salome sandals dress your urban summer looks as well as those of your evenings. Made entirely in the south of France, you will appreciate the quality of our know how and the beauty of the leather. Options: beige slip pads (heel and sole of leather). Other colors on request. Shipping included to mainland France. Braided strap model made with vegetable leather (without chrome - non allergic leather). You can customize the braid color with different leathers.